Braveheart is the best movie ever made. Now don’t start yelling, hear me out. It’s not my favorite film, it’s not a perfectly sculpted work of art, it’s not without its flaws, its only partially true, and when compiling a Top 10 I doubt it makes most critics’ lists. So I understand your cynicism when I call it the greatest movie. But first let’s separate movies from films. Let’s call movies entertaining and lets call films fascinating. As far as movies go, Braveheart should be the gold standard. It delivers every single aspect you could ask for from an entertainment perspective: story, character, action, blood, music, humor, heart, love, war, friendship, honor, history. There’s a little taste of everything here, a bit for everybody, a movie that gives us what we want when it comes to enjoyment, entertainment, and the theatre experience. 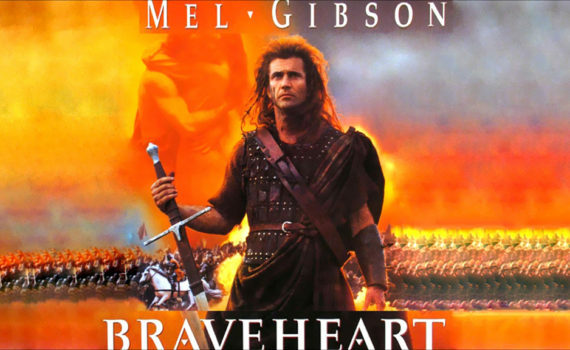 Braveheart does it all and has been copied countless times in an effort to recapture the magic of a movie that may have hooked us in a couple of cheap ways, but man did it hook us, and man are we glad it did. This is the “true” story of William Wallace. As a boy, Wallace grew up in a Scotland that had no king, a country whose nobles fought for power, and whose people bent knee to England’s most ruthless sovereign, Edward the Longshanks. Wallace witnessed Longshanks’ methods early, seeing the murder of patriotic Scotsman and later the deaths of his father & brother. Years later, having been educated by an uncle, Wallace returns home to find a wife and to start a family. He only wants to live in peace, but when his love is taken from him he will stop at nothing for revenge. Rallying the angry Scottish peasantry and defying the traitorous nobles, Wallace fights Longshanks and his English rule, determined to make Scotland a free country once again. Braveheart is an amazing movie, it’s that simple. Again, not a perfect film perhaps, but an excellent source of quality entertainment that delivers all we could ask for from an epic biography. The story may not be 100% accurate, but I’d rather enjoy myself than watch three hours of facts run across the screen; if I want information I’ll read a book. That’s the problem with too many biopics; they stick to the story but forget their audiences. Braveheart has no such problem. Yes it’s long & dramatic, but it’s highly enjoyable, always interesting, and hooks us in a way few movies have ever done. The accents are shaky from time to time, especially Mel Gibson’s, the story relies heavily on emotion that could be described as cheesy, and the battle scenes are a bit heavy handed, literally lopping off limbs with heavy objects. But the movie overcomes its flaws, which can’t be said often. It’s a plot that’s historically based, well crafted, strongly acted, touched with humor, supported by a phenomenal soundtrack, and worth every minute of the time it took to tell such an entertaining story so well. Gibson stars & directs, never better in either capacity, his cast is perfection, his action sequences never feel forced (The Patriot), and ultimately what we get is a project that was produced with thought & detail. It’s the best movie I’ve ever seen, if you’re looking for pure package entertainment.